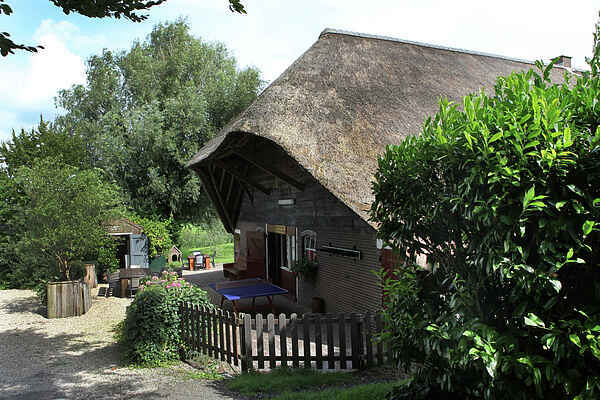 This thatched farmhouse is in the Betuwe, a country area between Leerdam and Kedichem. The farmhouse is near the River Linge. A holiday home has been created in the front of the farm. It has its own child-friendly, enclosed garden and terrace. The home is near the Lingedijk. You can enjoy excellent walks and cycle trips and admire the delightful views of the River Linge. The river is excellent for fishing and boating. You can also enjoy a tour on a sightseeing boat. The picturesque little town of Heukelom can be reached by a ferry on the Linge. The ferry carries pedestrians and bicycles. The glass town of Leerdam is just 2 km away.